It’s Day 173 and it’s a beautiful summer day out! We did have a little ant party going on in my best girl roommate Karli’s kitchen this morning though. I think it’s all under control now. 🙂 Other than that just painting and doing something exciting tonight. Also getting the house tidy for the appraiser on Tuesday. We just want to get it reappraised since we put so much work into it when we bought it. Whew. 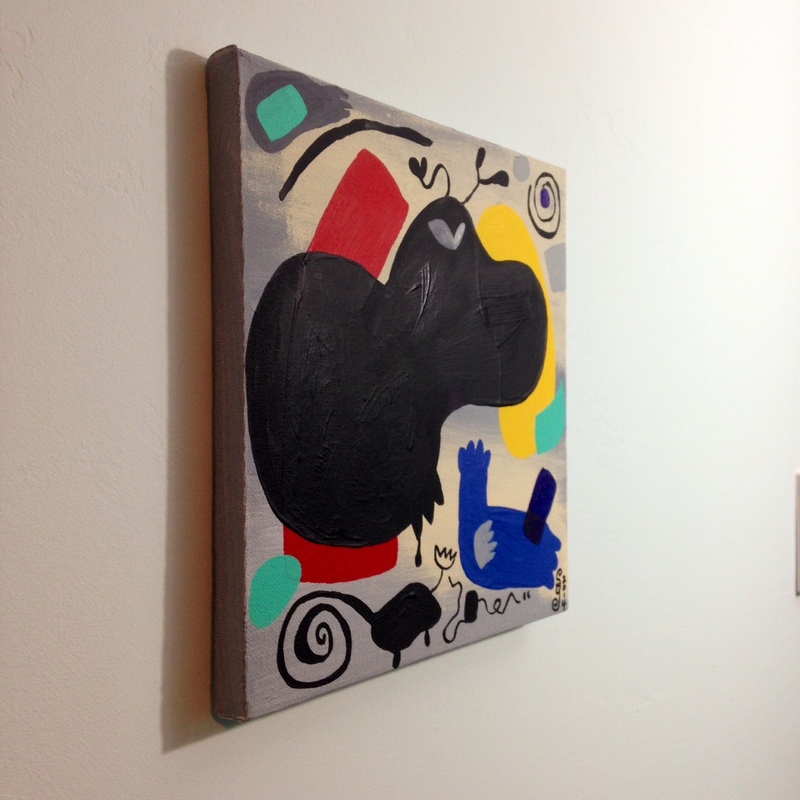 Join me in honoring Willi Baumeister today. It was a challenge only because I wanted to do so much. 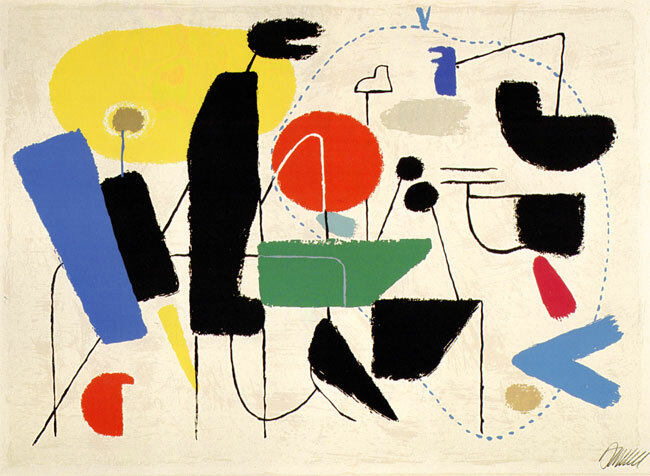 Willi Baumeister (January 22, 1889 – August 31, 1955) was a German painter, scenic designer, art professor, and typographer. decorative painter in his native city from 1905 to 1907, followed by military service (fall 1907–1908). During his apprenticeship, Baumeister also began art studies at the Stuttgart Art Academy (Königlich Württembergische Akademie) (1905–1906), attended Robert Poetzelberger’s drawing class, and took additional lessons fromJosef Kerschensteiner. In 1906 he resumed his apprenticeship and, in 1907, completed the trade test. expressionist painter Franz Marc. In 1914 Baumeister had his first solo exhibition at Der Neue Kunstsalon (New Art Salon) in Stuttgart. In the same year, Adolf Hölzel arranged a commission for wall paintings at the Deutsche Werkbund-Ausstellung (German Werkbund Exhibition) in Cologne for Baumeister, Schlemmer, and Herman Stenner. Prior to being drafted into the army in the summer of 1914 (until 1918), Baumeister travelled to Amsterdam, London, and Paris. During the war, Baumeister met the painter Oskar Kokoschka and the architect Adolf Loos in Vienna in 1915. In 1916 he participated in the exhibition Hölzel und sein Kreis (Hölzel and his Circle) at the Art Association in Freiburg im Breisgau, which was subsequently shown at the Ludwig Schames Art Salon in Frankfurt am Main. In 1918, still prior to being discharged from military service, he threw an exhibition with his friend Oskar Schlemmer at the Galerie Schaller in Stuttgart. Baumeister and Schlemmer campaigned to bring Paul Klee to the Stuttgart Academy, which was rejected by the Academy. Klee, for his part, would have been willing to come. 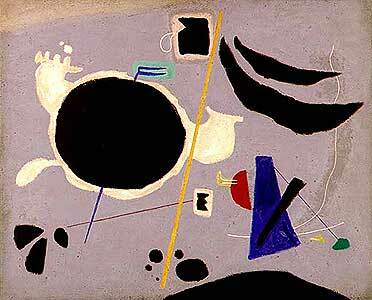 In 1919 Baumeister became a member of the Berlin artist association Novembergruppe (November Group). The group was founded by Max Pechstein in 1918, immediately following Germany’s capitulation and the fall of the monarchy. It remained one of the most important alliances of German artists until 1933.
offered, in the same year, the opportunity to take part in the International Exhibition of Modern Art in New York, followed by a solo exhibition in Paris the following year, where he also participated in the Große Berliner Kunstausstellung (Great Berlin Art Exhibition) (with his own room), where he met Kasimir Malevich. In 1927 Baumeister accepted a teaching post at the Frankfurt School of Applied Arts, later known the Städel. There he taught from 1928 a class in commercial art, typography, and textile printing. That very year, his daughter was born. The following year he turned down a position at the Bauhaus in Dessau. A member of the ring neue werbegestalter(Circle of New Commercial Designers) (chairman: Kurt Schwitters) since 1927, Baumeister joined the artist association Cercle et Carré (Circle and Square) in 1930. In the same year, he received the Württemberg State Prize for the painting Line Figure. 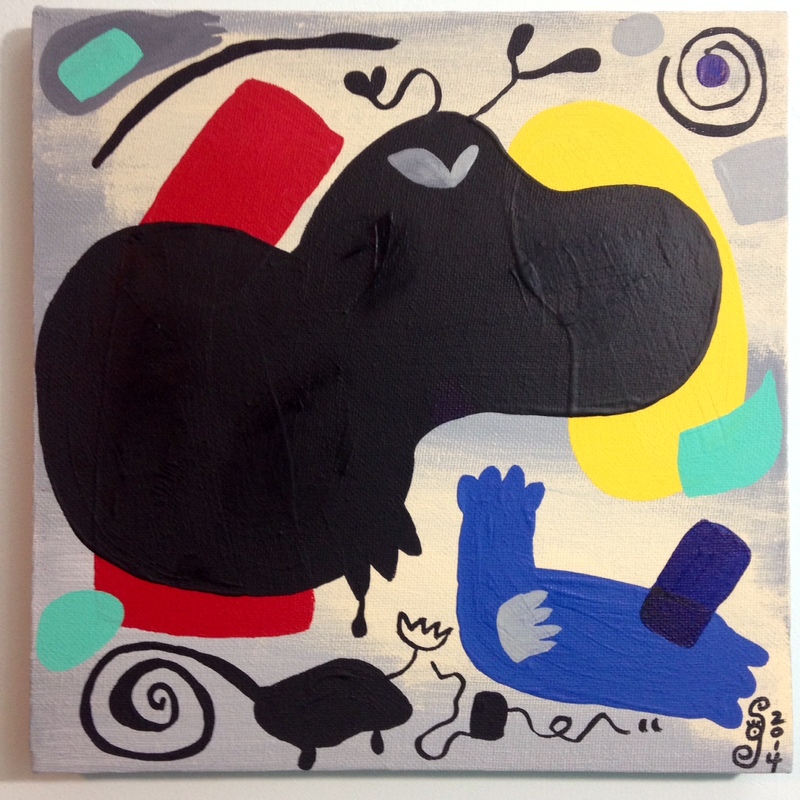 After “Cercle et Carré”, he also became a member of the artist association “Abstraction-Création” inParis. On the 31st of March 1933, following the National Socialist rise to power, Baumeister was dismissed from his professorship at the Städel. His colleague Professor Albert Windisch and Wilhelm Biering continued his lessons. Thereafter Baumeister earned his living mainly from commercial art, he was still however able to travel to Switzerland, Italy, and France. In the same year, his daughter Felicitas was born. In 1936 he was introduced by the Wuppertaler architect Heinz Rasch, with whom he work during the 1924 Exhibition in Stuttgart, to Dr. Kurt Herberts, the owner of a varnish factory in Wuppertal. He began working for the company in 1937, joining other artists ostracized by the National Socialist regime: Franz Krause, Alfred Lörcher, Georg Muche, and Oskar Schlemmer, and the art historian Hans Hildebrandt. That year five of his works were shown in the National Socialist exhibition Entartete Kunst (Degenerate art) in Munich. Until 1941, when a ban on his paintings and exhibitions was issued by the National Arts Chamber, Baumeister still had many opportunities to exhibit his works abroad in Europe. Despite the prohibition and the constant surveillance, he still worked at the Herberts varnish factory, as well as on his art. In 1943, when a bomb attack rendered Wuppertal as well as Baumeister’s house in Stuttgart uninhabitable, he moved with his family to Urach in the Swabian Alps. which was only published in 1947, even though he had completed the manuscript in 1943–44. In 1946 he received the position to teach a class in decorative paintings at the Stuttgart Academy of Arts and in 1947 resumed his exhibition activities. 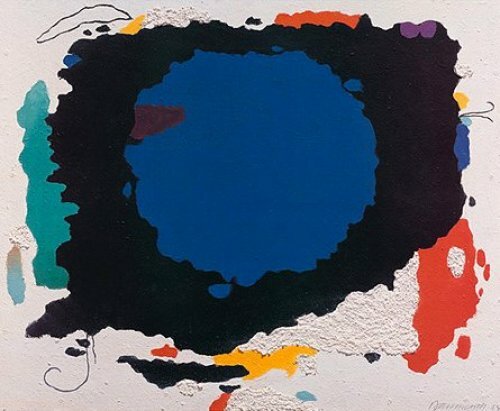 In 1949 he became the co-founder of the artist group Gegenstandlose (The Group of Nonrepresentational Artists), which threw its first exhibition called ZEN 49 in 1950. Here Baumeister met Fritz Winter, Ernst Wilhelm Nay, Paul Fontaine, and many others who worked in the field of fine arts after the end of the war and the dictatorship in Germany to forge a new beginning and connection to international developments. 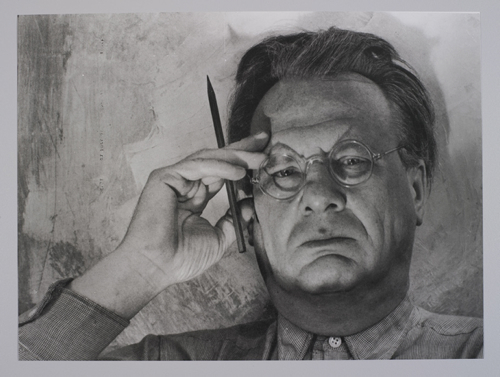 In his participation in the Erstes Darmstädter Gespräch (First Darmstadt Dialogue) in July 1950, at the exhibition Das Menschenbild in unserer Zeit (The Human Image of Our Time), Baumeister defended modern art against Hans Sedlmayr’s thesis of a “loss of the center” (“Verlust der Mitte”). Henceforth until his death in 1955 Baumeister stood at the peak of his artistic career, which was demonstrated by his participation in many national and international exhibitions such as the Venice Biennale in 1948, the São Paulo Biennale (Brazil) in 1951 (where he received a prize for his painting Cosmic Gesture), and Younger European Artists at the Guggenheim Museum in New York in 1953. 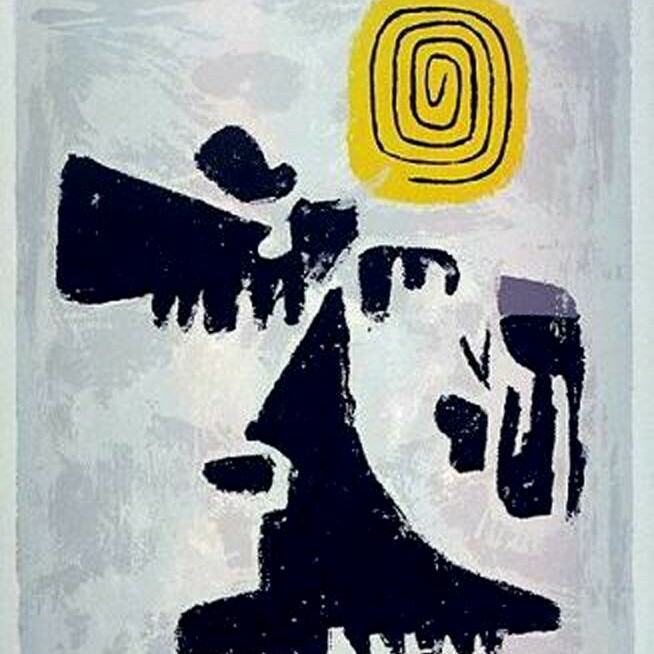 In 1955 Willi Baumeister retired (emeritus) from the Stuttgart Art Academy, although he still received a teaching contract for the following semester. On the 31st of August 1955, he died sitting with his brush in his hand in his atelier in Stuttgart. Baumeister took part in his first exhibition in 1910, showing figurative works inspired by impressionism. His chief interest was even at this time already in cubism and Paul Cézanne, whose work remained important to him throughout his life. These influences of impressionism and cubism that shaped Baumeister’s early paintings played an essential role in his work until the end of the 1920s. On the one hand, his representational painting was increasingly reduced (abstracting and geometric) as it gained form and lost depth. Parallel to the paintings of his friend Oskar Schlemmer, Baumeister’s independent exploration of form and color emerged. Already around 1919, his teacher Adolf Hölzel wrote to him: “Out of all of us, you will be the one who will achieve the most.” Also worth noticing is that the idiosyncratic German path into modernism, expressionism, barely resonates at all in Baumeister’s work, even though he had met, for instance, Franz Marc earlier on, and was certainly acquainted with the works of the Brücke (Bridge) artists and those of the Blaue Reiter (Blue Rider). 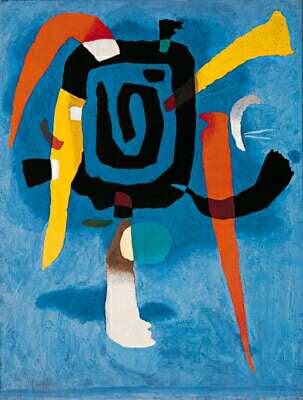 After his return from the First World War, Baumeister rigorously developed his work further. Although one still finds figurative elements in his paintings, the forms grew increasingly geometric and took on a dynamic of their own, and Baumeister broke the traditional connection between form and color. Various work groups emerged at this time, including the relief-like wall pictures, and paintings with sports theme (as a symbol for modernity). 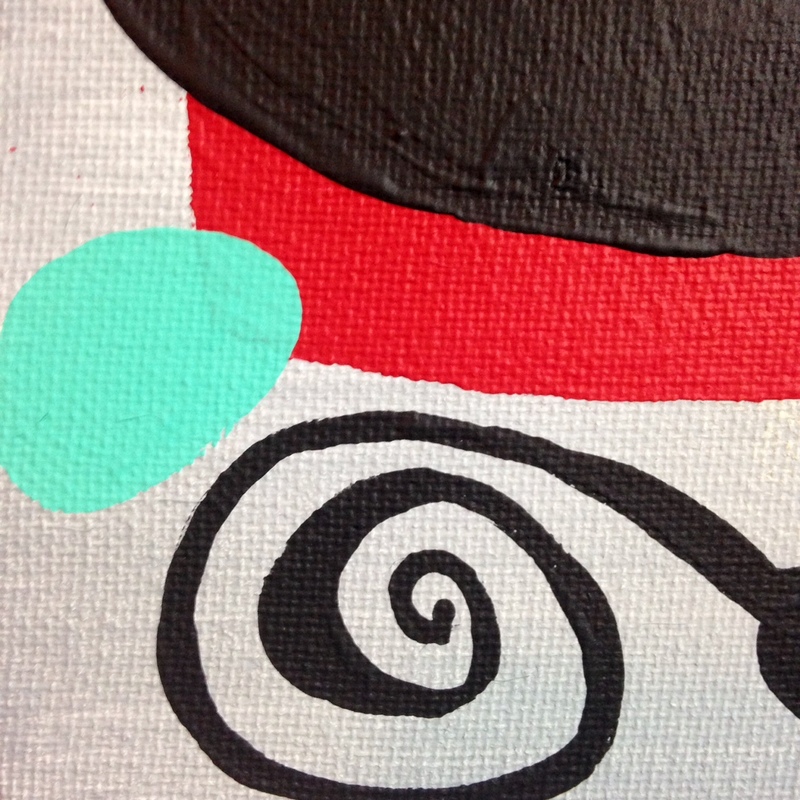 In his painting, the grappling with shapes and material of the painting as well as the relationship between reality and representation became visible. 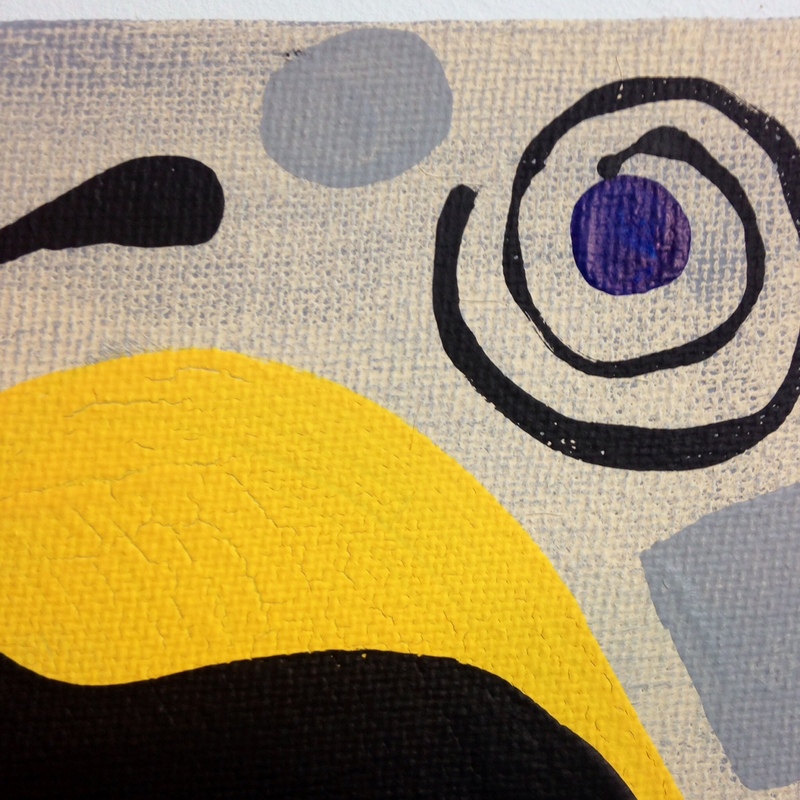 Parallel to this development, nonrepresentational painting began to gain a foothold in works that centered on geometric shapes and their relationships to one another in the picture (e.g. Planar Relation of 1920). Baumeister’s lively exchange with other German and foreign artists must also be seen as vitally important in the consequent development of his work. Indeed, as it was for many of his fellow artists, posing such questions was part of the agenda of the modern age (for example, El Lissitzky, Kazimir Malevich, Wassily Kandinsky, Fernand Léger, Amédée Ozenfant, Le Corbusier, Paul Klee). elementary shapes of the circle, triangle, and square towards organic forms. Although this development could also be observed concurrently in the work of other artists of his time, in Baumeister’s case, it was tied to his fascination for the prehistoric and archaic paintings. Baumeister intensely explored artifacts of early paintings and integrated this pictorial experience into his own painting. He identified the symbols, signs, and figures of cave painting as components of a valid archaic pictorial language that he used in his works. 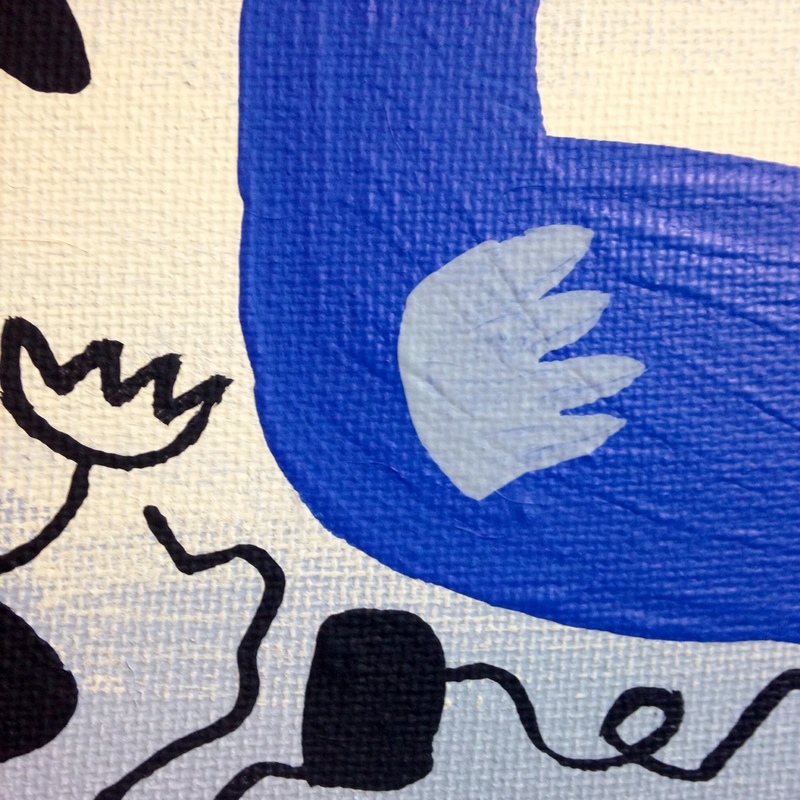 These included his increasing number of paintings in “oil on sand on canvas” that, in their materials, also approached the cave painting that Baumeister so admired (beg. ca. 1933). He himself collected examples of prehistoric findings, small sculptures, and tools, and occupied himself with cliff drawings that had been discovered in Rhodesia. This experience was undoubtedly important for Baumeister’s artistic disposition since he, evidently inspired by this rich store of prehistoric works, ultimately used extraordinarily reduced organic shapes for his “ideograms” (beg. ca. 1937). In these works he used a unique world of signs, which he saw as symbols for the laws of nature, their evolution, and human existence. Baumeister’s artistic development was not interrupted when he lost his professorship at the Städel in Frankfurt in 1933. He continued to paint despite political persecution and economic difficulties. His work and its development are correspondingly diverse, even for the period after 1941, when he was imposed with an exhibition prohibition. While on the one hand his employment at the Dr. Kurt Herberts & Co. varnish factory in Wuppertal to research antique and modern painting techniques protected him politically, it also on the other hand gave him the opportunity to explore the fundamentals of painting, so that he could further his knowledge on the prehistoric cave painting techniques. At the same time, he tuned to Goethe’s theory of plant morphology. 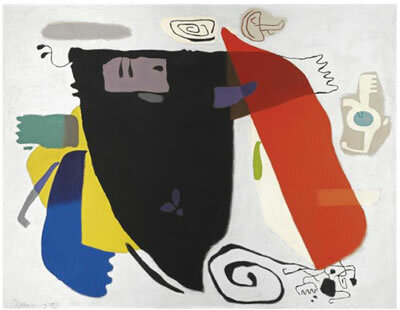 Out of this study the “eidos pictures” (eidos: idea) emerged: paintings that, unlike Baumeister’s ideograms, are rich in their variety and coloration. Moreover, the forms are organic, but seem to be less of symbols or signs, than images of simple plantlike and animal life forms. The pictures bear titles such as Rock Garden, Eidos, or Primordial Vegetable. As an indefatigable researcher and collector, Baumeister also owned examples of African sculpture, in which he, as in the case of the prehistorical artifacts, saw universal images for life, development, and human existence. Correspondingly, their formal language entered Baumeister’s work in the early 1940s—highly abstracted, at first chromatically restrained (African Tale, 1942), and with time, became increasingly colorful and in part very complex in their formal design (Owambo 1944–1948). 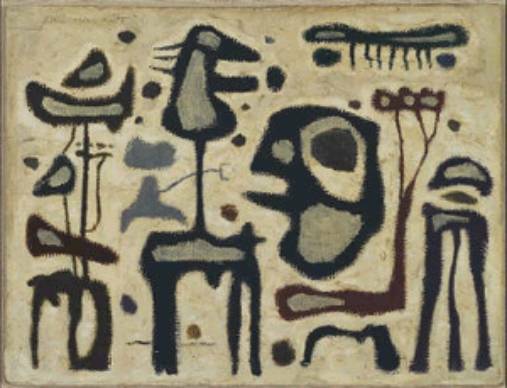 Both the titles and formal language reveal Baumeister’s preoccupation with other old (Latin American) cultures (‘Peruvian Wall, 1946, and Aztec Couple, 1948). Another example of his search for the “foundations of art” is Baumeister’s transposition of the Gilgamesh Epic, one of the oldest surviving literary works. Therefore, Baumeister used his personal pictorial and sign language in his illustration of the narrative (beg. 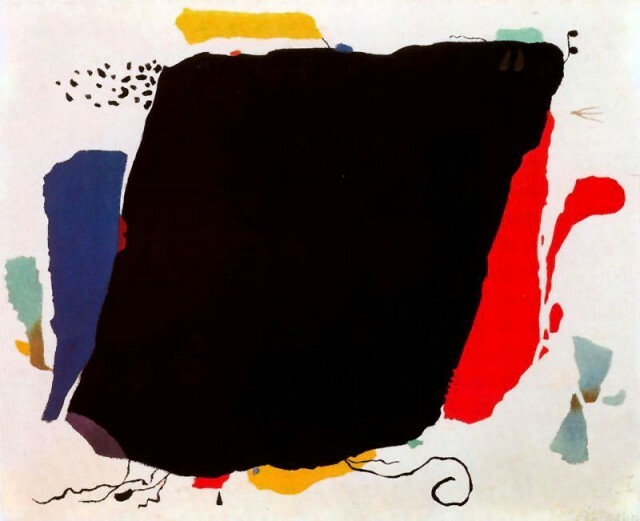 1943), which resulted in an astonishingly unified cycle, which with his pictorial language came strikingly close to depicting the literary and linguistic effects(impression) of the epic. He also produced illustrations to texts from the Bible—Saul, Esther, Salome—as well as to William Shakespeare’s The Tempest. 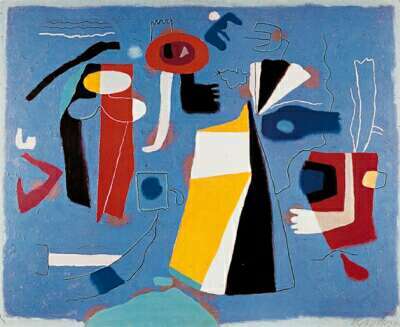 In this way, Baumeister single-mindedly and successfully developed a very personal and impressive visual language that was and still is unique in the German art immediately after 1945. 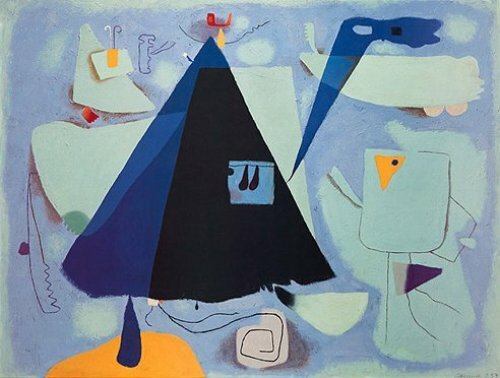 The national and international recognition that Willi Baumeister received in the postwar period was correspondingly high. But his artistic development did not stop there. 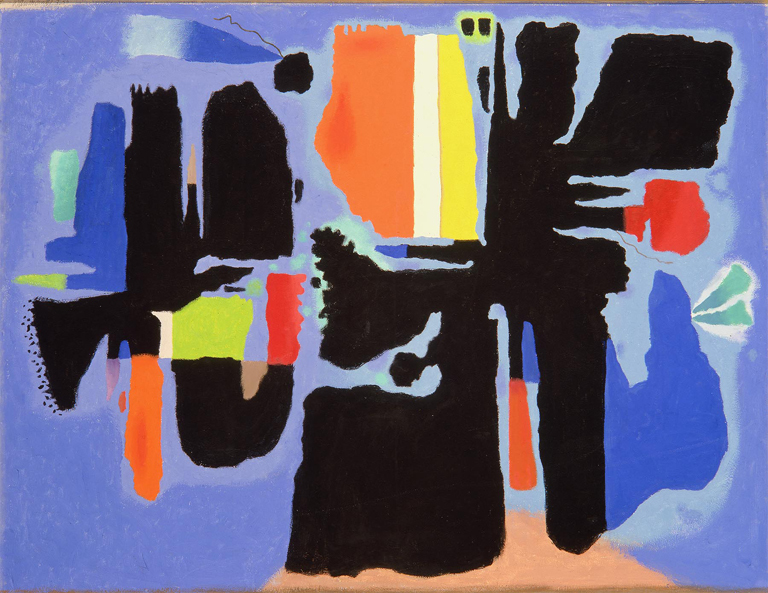 On the one hand, he developed his painting further in a virtuosic manner and, what is more, combined the variety of his formation phases in many other pictures—in part into “overalls structures” that nonetheless still possessed a fundamental that was reminiscent of landscape imageries (Blue Movement, 1950). 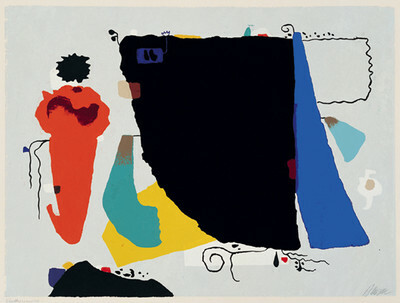 On the other hand, Baumeister also produced densely packed abstractions that, proceeding from a central form, characterized him as an outstanding “nonrepresentationalist.” These paintings became quite possibly the most famous of his works, and were immediately associated by a broad public with Baumeister (e.g. ARU 2, 1955). Even so, Baumeister did not limit himself to this late “trademark.” Multiform and multicoloured pictures emerged as well in the year of his death.